While airport security remains a priority in the post 9-11 world, federal budget cuts and transferring of TSA responsibilities to the airlines has airlines search for security solutions that safeguard their check point exits. Networked IP cameras offer superb security for checkpoint exits by using open sourced platforms on which third-party developers can implement video analytics solutions that have the potential to do everything from monitoring the number of travelers in line to alerting security if a traveler has gone the wrong way through a checkpoint. Let’s take a look at two applications that IP cameras can perform in an airport. IP cameras can be equipped with third-party software that can detect when a traveler has gone the wrong direction through a security checkpoint. If this is detected, the analytics can alert security, sound an alarm over the PA, and continue tracking the situation, even broadcasting it live to the mobile devices of security personnel. All that’s needed it is a nearby network switch for installation, and the camera can be maintained remotely from a central location. Though there are instances where a wrong direction transgression is unintentional, it’s worth it to have this system in place in the event that someone with malicious intent passes the checkpoint. The importance of proper management of foot-traffic is especially important in an airport, as travelers need to reach their flights on time, and even short delays cause backups and even result in lost revenue. IP cameras can assess the foot-traffic situation in real time in order to determine if there are any issues and alert authorities so they can fix the situation. 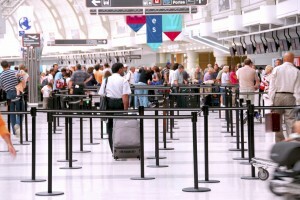 Cameras can determine everything from the number of passengers in line to the number being processed at the gate per minute, from which they can produce the data needed to predict the current wait time. Cameras can also detect overcrowded environments, abnormal distributions, and space occupancy, allowing airlines to open and close lines to promote maximum foot-traffic efficiency. This saves time and money by preventing backups and delays, and also boosts the image of the airline in the eyes of customer, creating the potential for more repeat customers. For any further questions about Video Surveillance Trends for 2014 simply contact ARK Systems at 1-800-995-0189 or click here today. Check us out on Facebook and Twitter as well! This entry was posted on Thursday, January 16th, 2014 at 3:07 pm. Both comments and pings are currently closed.